I was trying to remember why I hadn’t done a Read pile entry about Rick Remender’s Uncanny X-force, the 36 some issue run that I read again yesterday evening while trying to choke down the Oscars. But really, but as I was reading it I remembered why I didn’t write one previously, which was I was unimpressed with the large majority of it. Don’t get me wrong, I did enjoy bits and pieces of it, especially The Dark Angel Saga, thatsaw Archangel take up the mantle of Apocalypse, with Wolverine and gang fighting through the alternate dimension of Age of Apocalypse in some mad race to stop him. That whole story line was well written and built to a decent climax, but it was really the high water mark in a series that struggled to remain relevant after that was over. Remender tried to interject story lines about Captain Britain’s Omniverse and the reunification of a Brotherhood of Evil Mutants, but if anything I just found those stories confusing and unnecessarily complex, and as a result, I found myself towards the end of the series just half reading the stories in some vain attempt to pay lip service to a book I said I was going to finish. In fairness, I’ve never been a huge X-man fan to begin with. For some people, the X-men are the “be all, end all” of the Marvel Universe, a touchstone they can go back to time and time again because they care so deeply about the characters. For me, the X-men just never had that pull and even today, I connect way more with the other Marvel teams, like the Avengers or Fantastic Four than this rag tag bunch of mutants. But I’ve been a fan of Remender since his days of Fear Agent so I really wanted to give this book a chance. Plus, I wanted to read his Uncanny Avengers series because they are a bunch of characters I really love on that team, like Scarlet Witch and Havok. But it became apparent half way into the second story line that Uncanny Avengers is just an outgrowth of the story started in Uncanny X-Force, so that pretty much forced my hand to read it. 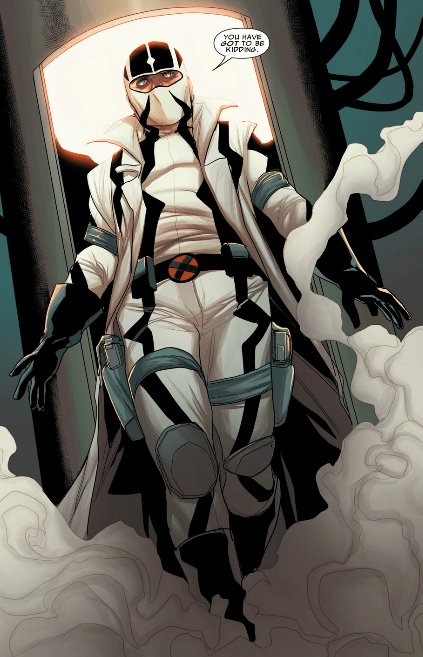 Plus, I wasn’t a huge fan of the character Fantomex, who Remender has a literary hard on for most of the series. Sure, it was nice to be introduced to a character that I didn’t have much exposure to previously, but when everything revolves around him and his motivations, it got more than a bit tedious. Fantomex reminded me too much of a bad 90s Image character, with his black/white trench coat, Spider man like mask, and double guns. It’s almost like a walking cliche than a real character design, and one that for me looked like a flat out rip off of Firefly from the GI Joe series. Despite some cool powers and some major league humanizing moments thanks to Remender’s deft touch, I still found myself saying “No Thanks” to the heaping piles of Cluster mcCluster, he was trying to shovel down my gullet. Maybe that’s why I liked the Dark Angel Saga more than the rest of his stories in the series, Fantomex took a back seat to Archangel who has always been one of my favorite X-men, and you really got a chance to see Warren Worrington the third spread his wings a bit and fly as the villain of the piece. Plus, the building action of the relationship between Angel and Psylocke is much more believable than the somewhat forced relationship between her and Fantomex which made up the remainder of the series. So the payoff is much better at the end of the Dark Angel Saga then the end of the entire series, even though in some ways, they are pretty much the same conclusions. Final say about Uncanny X-Force, it’s definitely a book I’d recommend to others, especially my friends that are X-fanatics. The Dark Angel saga and all the issues leading up are worthy chapters to add the continuing saga of Charles Xavier’s group of gifted youngsters. However, I’d also be lying if I didn’t say that once Dark Angel wraps up that the series goes on for like 15 issues longer than it has to and than most of the stories are meandering and without clear purpose.